Use a Tone effect to add a dark-coloured region to your drawing and simulate the shaded area away from a light source. 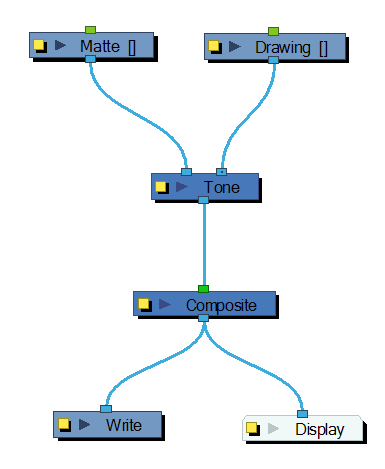 To produce the tone effect, create a drawing to control where the tone will appear. The Tone effect uses a matte to determine the shape and position of the tone on your drawing and can be blurred at the edges to create a softer effect. For information on all effects, check out the Online Help. The Tone Effect is shown here as an example. 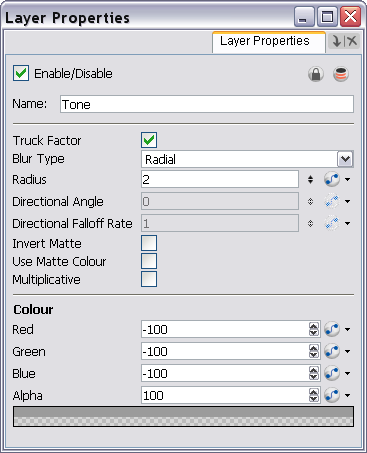 Use the Tone editor to control the type and amount of blur, as well as the colour of the tone. • Truck Factor: Activated by default, this option readjusts the blur when the elements undergo a change of depth or scale. When this option is disabled, the effect's values will remain unchanged regardless of depth or scale changes. It is recommended that this option be disabled when multiple drawings are composited and attached this effect. • If Radial is selected, Animate Pro will blur the edges of the matte evenly around points that make up the edge of the matte. • Invert Matte: Activate this option to invert the matte used to create the tone. • Use Matte Colour: Uses the matte shape colour to create the tone. • Multiplicative: Multiplies the tone colours with the background. • Red/Green/Blue/Alpha: In the RGBA fields, you can enter the value you want added to or subtracted from the colour channels in the drawings or you can attach these values to function curves.